Yesterday was the last day that the Green Market will be held outside. Through the rest of the year it can be found at the Peggy Notebaert Nature Museum. I was also pleased to notice on their website that they are planning to stay open all year round. I'm not completely sure what that means; one of the vendors told me they were not planning to be there after December, but I'm glad they're talking about staying open. It's always such a disappointment to me come January that I have to wait five whole months before I can so easily find local fare. My ambitions are still often much bigger than my schedule allows, though, and I don't always cook everything I have bought quickly enough and I have to scramble to come up with some quick alternatives to my more labor-intensive plans for some of the things I buy. The baby bok choy I used here actually came from Treasure Island, and after they had been sitting in the fridge for close to a week I realized I needed to do something with them, the sooner the better. I found these Trinidad peppers at the green market a couple of weeks ago. 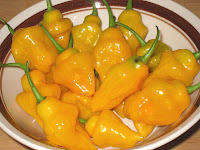 They looked a little like habaneros to me, and apparently they are from the same family, but they have just the tiniest hint of heat, more of a tingle, really, and a lovely fruity flavor. I took them home even though I didn't have any idea how I was going to prepare them. And then I got some more fresh-from-my-friend's-garden sweet banana peppers and I knew a bok-choy and trinidad and banana pepper dish was just around the corner. It was a work night and I didn't want to spend a lot of time in the kitchen, so I decided to do an all-in-one dish. At first I was going to use pasta to recreate my Spicy Pasta with Peppers, but it was on the warm side and I really didn't feel like heating up all that water and then having to deal with the pot afterwards. Couscous would cook up quickly and there would be no big old pot of hot water to deal with either. Adding grape tomatoes seemed like the perfect finishing touch. This would make a wonderful side dish to just about any entree. I took it to work and topped it with grated cheese. I got lots of positive comments on this one. 1 pint trinidad peppers, cored, seeded and halved. 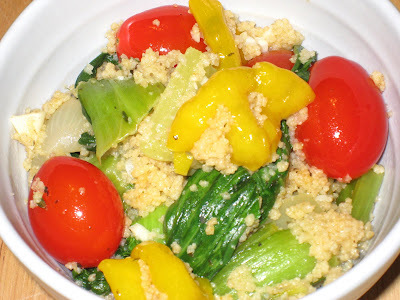 Cook couscous according to package directions, using broth instead of water. At the same time, heat canola oil in large skillet over medium high heat. Add onions and garlic and cook until translucent, three to five minutes. 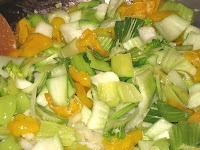 Add both peppers, bok choy stems, thyme oregano, basil and salt and pepper and cook for another five to seven minutes, until all the vegetables are translucent. 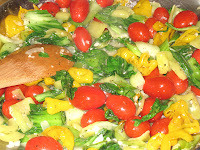 Add broth, bok choy leaves and grape tomatoes. Cook until tomatoes are heated through and liquid has reduced a little, about five minutes. 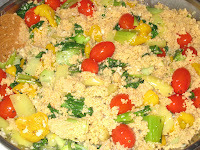 Add couscous and cook about five minutes more so the flavors can combine and the couscous absorb more of the liquid. Excellent as a side dish, or with grated cheese for a light lunch.